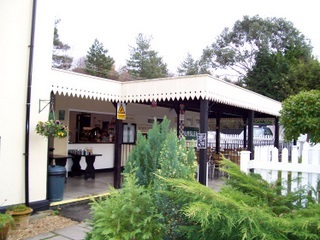 I've just spoken to the new owner of this New Forest tea room, The Old Station House at Holmsley. Looking at their new website I can see lots of changes have been made. It all looks very exciting and the food sounds good too. I'll be making a visit soon and will update any major changes to my photos too. This is a lovely old station house with lots of railway memorabilia and apparently now has a great little gift shop - good food and presents always hit the spot for me! I've had a look at the new menus and what has really pleased me is that as well as good, competitive pricing, local food producers have been used in the menus and also get a mention. This is what we're looking for in the New Forest, support of local food producers. It's why I would recommend The Old Station House at Holmsley. Start the day with a sumptuous breakfast Full English if you have the waistband room or have arrived from a walk or cycle Youn can also get a child's breakfast option which seemed extremely reasonable. Breakfast is served up to 11.30a.m. Lunch looks great and children get a menu choice from Fuel for Little Engines I like this idea! You're looking for a New Forest tea room and presumably a cream tea? You won't be disappointed. You can include a glass of prosecco with lunch (or tea?) or other alcohol if you like as it's a licensed premises. This old New Forest railway station has managed to combine the old and the new well even down to the authentic toilets. As you can see when you enter you feel you should be able to buy a train ticket and listen to the rumbling of an approaching steam train! I've checked on reviews and overall the food, surroundings and staff have offered really good value for money and excellent service. You can arrive here via the A35 or if you want via Burley, Christchurch, or Brockenhurst across the New Forest. It is really handy for a well earned break if you are cycling on one of my cycle routes Yes!.....bikes and cream teas do mix well! As well as offering a wonderful New Forest afternoon tea menu The Old Station House at Holmsley has a fascinating and varied history, which is very interesting. The railway station itself opened on June 1st 1847. You can still see many wonderful photos and memorabilia on the walls. 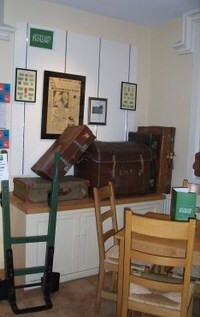 You are greeted by suitcases and a porters barrow when you enter the restaurant. The original building still stands and in its past has seen visits from Prince Edward (Queen Victoria's son) and Lillie Langtry (his very good friend! ), and also Kaiser Wilheim of Germany and his Cabinet, who were enroute to Highcliffe. It has a more recent WW11 connection too. It was used extensively during World War Two, to drop off supplies and equipment for troops, of many nationalities, based in the New Forest. The newly created Holmsley South Aerodrome would have found the railway station at Holmsley crucial logistically, during WW11. During WW11 Government officials would also have been seen here, especially during the set up of the D-Day landings in May 1944, organised by General Eisenhower. As you sit and relax, enjoying your naughty but nice cake or pastry selection - or lunch - take a good look at all the fascinating memorabilia on the walls; timetables, tickets and luggage from through the years. If you want to search New Forest Life.com without using the navigation bars on the left, then here's a really useful Google tool. 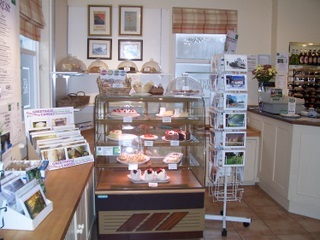 This New Forest Tea Room has so much to offer you. From breakfast to lunch to afternoon tea. 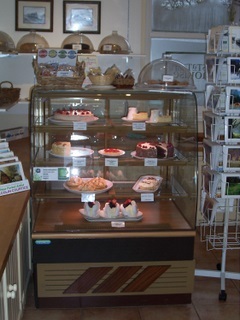 You will be eating local New Forest produce in lovely surroundings - enjoy! A New Forest Tea Room has so much to offer you whether you are looking for a lunch time meal, cream tea or afternoon tea and a cake - enjoy!